The living area consists of living room and dining room, with elegant, original Venetian floors and a feature fireplace. There is also a piano and a billiard room. From the living rooms and the kitchen you can enjoy a breath-taking view of Monte Baldo and the southern part of Lake Garda. 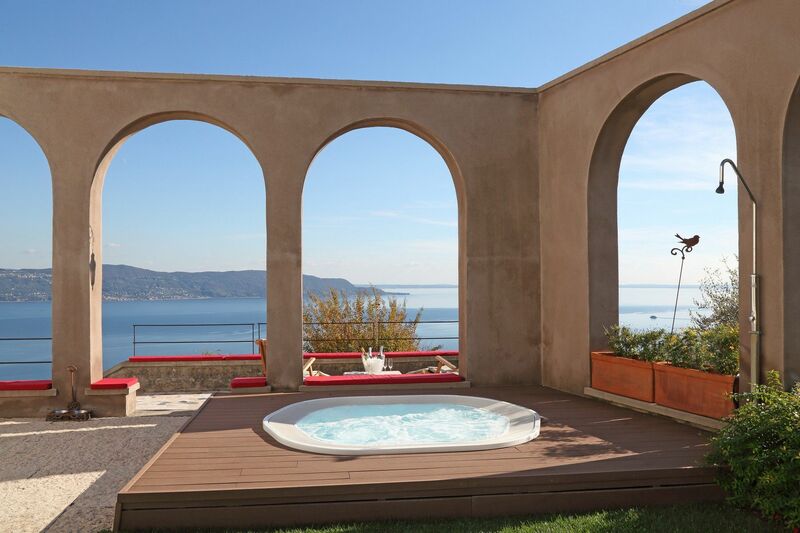 The villa has 4 double bedrooms, all recently renewed which maintain the original furnishing styled by the designer who counted the famous villa of the Italian Poet Gabriele D'Annunzio among his work, each with TV and private bathroom, offering room for 8 adults. Two bedrooms have terrace and lake view. First Floor: The villa has 4 double bedrooms, all recently renewed which maintain the original furnishing styled by the designer who could count the famous villa of the Italian Poet Gabriele D’Annunzio among his work, each with TV and private bathroom, offering availability for 8 adults. The house has air-conditioning. Two bedrooms have terrace and lake view. salt/pepper/vinegar, sugar, coffee, toilet paper, kitchen paper, garbage bags, detergents.